Thick cylinders, spheres, and disks are components of many structural systems. Due to their capacity to withstand high pressures, radial loads, and radial temperature gradients, the problem of thermal stress calculations is an important design issue. 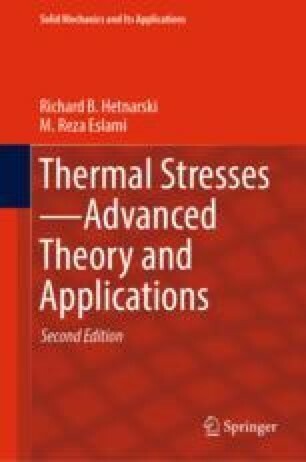 This chapter presents the method to calculate thermal stresses in such structural members which are made either of homogeneous/isotropic materials or of functionally graded materials. The latter ones, classified as new materials, are mainly designed to withstand high temperatures and high temperature gradients, and they may be designed in such a way that the applied loads, mechanical or thermal, produce a uniform stress distribution across their radial direction. Functionally graded materials exhibit the unique design features, where by selection of proper grading profiles, stress distribution within the element may be optimized.